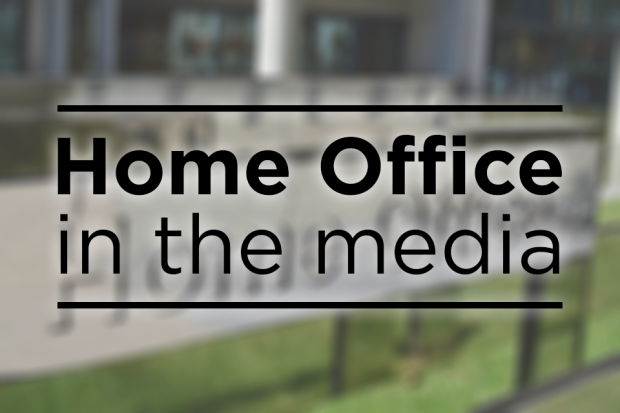 The main stories of interest to the Home Office this morning relate to a report into terrorism suspects using human rights laws to avoid being deported and news that there have been record civil penalty fines given to HGV drivers. Newspapers including the Express, Mail, Times and the Sun carry articles following up on a Sunday Telegraph story which focused on an unpublished report into deportations with assurances written by law expert Clive Walker and David Anderson QC. The report claims that more than 40 foreign terrorism suspects are using human rights laws to avoid being deported. Our comment on the reports is below. We pursue every possible avenue to remove foreign nationals who threaten our national security and deportation with assurances is just one weapon in our wider armoury. Our priority will always be the safety and protection of the British public and we will continue to seek to remove those who wish to do harm to this country. The Express, Times, Mail and Metro all report that record numbers of civil penalties have been issued to hauliers after illegal immigrants managed to stowaway on their vehicle because adequate steps were not taken to secure their lorry. The papers say that drivers were hit with 3,552 penalty notices between April 2016 and 2017. The Home Office response can be found below. Action is only taken if proved that hauliers did not take adequate measures. It is in all our interests to combat attempts to enter the UK illegally, which can damage the haulage industry financially and place the safety of drivers at risk. That is why we continue to work closely with the French to bolster security at the ports, tackle the organised crime networks behind trafficking and people-smuggling, and ensure hauliers and other travellers can travel through the ports safely. Most hauliers take their responsibilities for vehicle security seriously - the fines imposed are designed to ensure that all drivers take reasonable measures.